doesn’t anyone want to know how MY drink is? 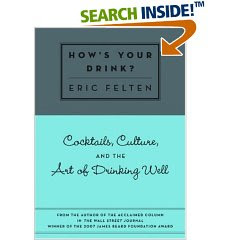 From Amazon.com’s description of Eric Felten’s How’s Your Drink? Based on the popular feature in the Saturday Wall Street Journal, How’s Your Drink illuminates the culture of the cocktail. Cocktails are back after decades of decline, but the literature and lore of the classics has been missing. John F. Kennedy played nuclear brinksmanship with a gin and tonic in his hand. Teddy Roosevelt took the witness stand to testify that six mint juleps over the course of his presidency did not make him a drunk. Ernest Hemingway and Raymond Chandler both did their part to promote the gimlet. Fighting men mixed drinks with whatever liquor could be scavenged between barrages, raising glasses to celebrate victory and to ease the pain of defeat. Eric Felten tells all of these stories and many more, and also offers exhaustively researched cocktail recipes. How’s Your Drink is an essential addition to the literature of spirits and a fantastic holiday gift for husbands and fathers. Husbands and fathers? What about sisters, mothers and wives? I’d have LOVED to have received a copy of this wonderful book in my Christmas stocking, (with any luck, my sweetie will read this post and consider getting it for me for Valentine’s Day) but after reading this little blurb of copy, I’m not sure I’m allowed! Eric Felten’s How’s Your Drink pubbed this fall and I had the good fortune to page through Contessa’s copy shortly after it came out. It’s a great little book, but I’m shocked to see how blatantly excluded I and my fellow drinking broads have been from the publishing company’s marketing campaign. I used to work in-house at a publishing house and I realize that Amazon uploads book description copy written impossibly early in the publishing process. I also know that Amazon is notoriously slow about making changes to said copy: so even if the publisher did want to broaden the scope of this marketing blurb, it might take them six to eight months to do it. But, come on, people! Last time I checked women aged 18-35 represented one of the most powerful purchasing demographics in the marketplace. Why so blatantly exclude us from your marketing campaign? Fortunately, I know the book rocks, and plan to buy it anyway, thanks to the all-women’s cocktail society to which I happily belong.